Rockfalls, regularities and rivers. But still no bears. Our last day in Montana, a State which has proved to be so popular with the crews and as we drove up the Bitteroot Valley many of us looked through the rear view mirror a little more than usual. 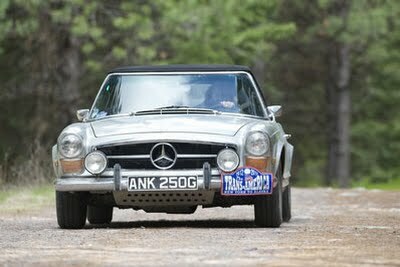 But on to the Rally, both of the tests scheduled for his morning were a proper test of precise navigation. Only those with exceptional powers of time and distance judgement would stand a chance of achieving the target time. This was going to be about pinpoint accuracy with the stopwatch and the throttle. Yesterday and the day before was about the wide open spaces, the 'range' and the mountains, today was about the woods. Enclosed and dark with no chance to see round the next corner to get a fix on your time or position. You were, if you like, flying on instruments. 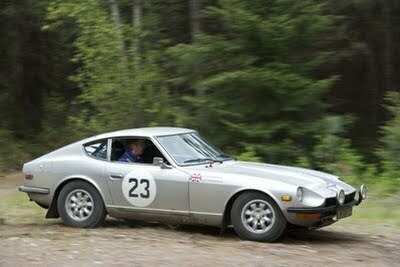 The tests themselves were short, there were relatively long Tarmac sections which allowed you to make up time, while the brief but twisty gravel 'deviations' allowed you to lose time. It's surprising how tight a regularity can be when you throw in a few hundred meters of forest floor, hairpins and off camber corners. Big old cars turn surprisingly slowly and if anyone doubted that a regularity section so slow and so short could be so closely fought then they only had to witness the reaction of Gerry Crown and Matt Bryson who, at the finish of the second test, whooped with delight when they learned that they had taken precious seconds from Richard Worts and Nicola Shackleton while Alistair and Dorothy Caldwell also lost a few seconds. Unsporting? Not really. All of these crews are serious competitors and at the very least there's a lot of professional pride at stake. Most crews made a decent fist of the sections but some - no names, no pack drill - were seen to head up into the hills only to return minutes later cursing their lack of attention. So with the business of regularity over it was time for lunch and today we had the pleasure of convening in Little Joe's Cafe in Troy where once again the simple fare on offer was more than adequate after the mornings excitement and once again Rally spirits were high with Irvine and Wilson Laidlaw full of praise for the mornings route which had to be tweaked at the last minute because of land slip / flood damage. We also chatted to Geoff Nicholls, car 40 who had replaced the clutch way back at the Virginia International Raceway. The car was going well but the new clutch still felt a bit sticky sometimes and he was debating whether to leave well alone or take another look. With lunch and pleasantries out of the way we crossed into Idaho during the afternoon on our way to the night halt at Coeur d'Alene a town which stands on the beautiful lake of same name. We're staying at Coeur d'Alene Resort Hotel (something of a pattern emerging here) and, with our clocks going back an hour most crews were able to get in a couple of well deserved sundowners out on the deck with powerboats and float planes providing a little extra wow factor. Incidentally, the town was discovered by French Canadian fur traders and its name translates to 'Heart of an Awl', the local tribes were considered to be tough businessmen. More recently though the town has found fame by having some of the best Christmas light displays in the USA so there is a soft side to it. Problems during the day were once again few and far between. Car 8 Barbara and Michael Hurdle suffered a puncture which was repaired by the sweep crews. Keith and Nora Ashworth in car 14 needed a new brake calliper and late last night serendipity smiled upon them. A chance encounter with a local man who also owned a Classic Mercedes led them to his house and the exact replacement part. Tomorrow we move to Canada and the first leg of the adventure begins to move to its finish. Let's hope the bears know we're coming and finally show themselves.